A grant-aid scheme to set up CCTV systems in neighbourhoods has been announced by Minister for Justice Frances Fitzgerald who said she hoped the plan would help rural communities affected by crime. Under the scheme, eligible community groups can apply for grant aid of up to 60 per cent of the total capital cost of a proposed CCTV system, up to a maximum grant of €40,000. Upon approval, the applicant will receive an upfront payment of 50 per cent of the grant with the balance to be paid when the system is fully operational. In order to qualify for the scheme, applicants must be approved by the local joint policing committee, and comply with the CCTV code of practice which sets out the conditions which must be adhered to. The code of practice says each local authority must undertake to act as a “data controller” which nominates a “manager or designated person” who will have responsibility for ensuring the proper operation of the system. Respect for people’s privacy where no criminal offence is being committed should be of “primary consideration”. It is not permitted to use the cameras to look into any premises, be they public houses, shops, business premises or private dwellings. It further stipulates that signs should be placed in the area so people are aware that they are entering a district which is covered by a CCTV system. Images should not be retained by the data controller for longer than is necessary, and should be erased after a period of 31 days unless required by the Garda for evidence or the investigation of offences. Ms Fitzgerald said some of the key objectives of the scheme would be to enhance existing policing provision within communities, and to assist in the prevention and reduction of local crime, disorder and anti-social activity. Furthermore, she said, the scheme could “increase community involvement in the provision of legitimate, integrated responses to prevent and reduce crime in local areas in association with appropriate agencies”. “I am very conscious of the value that communities, especially rural communities, place on CCTV as a means of deterring crime and assisting in the detection of offenders,” she said. It is intended the scheme will run for three years with funding of €1 million being made available each year. 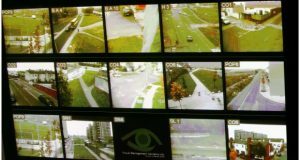 Irish Rural Link chief executive Séamus Boland said CCTV “adds to the modern-day policing of crime”. Three years ago in Dunmore, Co Laois, 20 cameras were placed at seven locations on every road in and out of the area. Dunmore Community Alert secretary Barry Foley said the cameras have “pushed crime right out”. “At our last agm, our local sergeant came in to thank us because although some crimes had been committed outside our area, the evidence from the camera placed the perpetrators in the vicinity,” he said. We have extensive experience in helping our clients identify their specific needs and pairing them with the proper security products. We are industry specialists and have some of the best security camera systems for business as well as residential applications. GME Security is the premier choice when you are looking for and selecting among security camera systems for business. We have a team of knowledgeable technicians who can help guide you through the process finding the optimal choices in security camera systems for business applications that are tailored to your needs. There are numerous advantages to the installation of professional surveillance technology for your company. Today most entrepreneurs understand or at least have heard that security camera systems for business are one of the savviest investments you can make. GME Security works with some of the best manufacturers in the world in order to create high-quality security technology and be able to offer these products at competitive prices. There are various reasons to begin looking for security camera systems for business applications. In this article, we break down five huge benefits of integrating a video monitoring system to your business. When you are selecting a security camera systems for business you may be concerned about the technology’s usefulness as your needs evolve or your business expands. At GME Security we supply high-quality security camera systems for business applications that can be easily modified or expanded upon. This is advantageous because it means that as the coverage area of your property begins to expand you can make an easily make adjustments to your system. Our team at GME Security can help you find security camera systems for business applications that will meet all your current needs while also having the ability to grow alongside your company. Most individuals can agree that the main application of security camera systems for business is to provide your company’s property with protection. Business owners and entrepreneurs tend to place a good amount of effort into the protection of their company’s locale and assets. Security camera systems for business have been proven to be highly effective forms of crime deterrence. This is an excellent feat to receive from security camera systems for business because it means that the presence alone of you professional CCTV technology can be enough to drive away significant amounts of criminal activity and vandalism. Having an effective method of crime deterrence through security camera systems for business gives you peace mind. GME Security understands that criminals are consistently on the lookout for the easiest target. Having professional security camera systems for business installed is one of the most sure fire methods of protecting companies. One of the biggest advantages of selecting among security camera systems for business from GME Security is that our CCTV technology comes integrated with easy to use remote video monitoring capabilities. At GME Security we strive to be the providers of state of the art technology through the various products that we offer. Security camera systems for business by SCK are some of the best in the market. We provide a clean and sleek mobile interface for remote video monitoring that is compatible with both apple and android devices. Remote video monitoring allows you see exactly what is going on at your property twenty-four hours a day no matter where you are in the world. GME Security has built a solid reputation of providing high-quality security camera solutions for homes and businesses. We a team of proficient technicians and service representatives that can answer any questions that you may have regarding our video surveillance technology. Contact us today to speak to a GME Security representative about the integration of security camera systems for business at your locale. A surveillance camera system is one of the most proficient security measures that you can integrate into your property. A high-quality surveillance camera system will help deter unwanted visitors and criminal activity like property invasion and theft. GME Securityserves the security industry as a designer, manufacturer, and supplier of high-end surveillance camera systems, CCTV technology, and quality security product accessories. Our team consists of surveillance camera system aficionados who demonstrate a passion for technology design, integration, advancements, and more. Our experiences and knowledgeable surveillance camera system engineers are consistently working toward the improvement of our product designs and their capabilities. At GME Securitywe strive to provide our clients with cutting edge security system technology products. During our years of serving the security industry, we have established close connections to some of the world’s best camera and electronics manufacturers in order to bring our camera, DVR, and other surveillance technology designs and prototypes to life. The connections that we’ve forged with the world class manufacturers who help assemble our technology allows us to offer our clientele state-of-the-art surveillance camera system at some of the best prices available in the industry. The integration of motion detection cameras has brought numerous advantages to the security industry. Motion detection capable cameras allow property owners to receive notifications via mobile device whenever a motion detection sensor has been triggered. With a motion-detection enabled surveillance camera system, you can configure your system so that you will be notified when there’s any activity outside of normal hours. This is a simple yet very effective method of ensuring that your property is safe and that no one that shouldn’t be present is. GME Security can provide you with high-quality surveillance camera system technology and motion detection cameras. In recent years night vision capabilities have become one of the most sought after surveillance camera system features among current security technology. A high-quality surveillance camera system with night vision means that you will be able to capture footage in low- to no-light situations. Having a night vision, or infrared, cable surveillance camera system is highly beneficial for the protection of residential and business properties because much of the criminal activity that occurs such as theft is planned and carried out under the cover of night. GME Security can pair you with some of the best infrared capable surveillance camera system technology in the industry. Motorized zoom lens capable cameras are ideal if you are looking for a surveillance camera system with a fair amount of control of your field of view. If you have been looking to get the most field of view capabilities from you surveillance camera system you should select cameras with motorized zoom lens. Field of view refers to the scope of vision that you’ll typically have over the visible world at any given point in time. For cameras, the field of view is simply the area span that the camera is able to capture with current configuration settings, applied zoom, and camera angle. A motorized zoom lens cable will give you the most control over your current field of vision in a convenient and easily accessible way. GME Security has extensive experience helping supply full high definition security camera systems for businesses of all kinds and sizes. This means that no matter what your property’s specific needs our team can expertly work to meet them. At GME Security we fully customizable surveillance camera system packages. https://www.gmesecurity.ie/wp-content/uploads/2017/06/GME.LOGO_.white_.png 0 0 Gavin Malone https://www.gmesecurity.ie/wp-content/uploads/2017/06/GME.LOGO_.white_.png Gavin Malone2017-08-22 12:47:292017-08-22 12:47:29What are the Most Beneficial Surveillance Camera System Features?